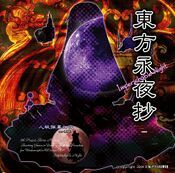 Yuyuko Saigyouji (西行寺　幽々子, Saigyouji Yuyuko) is the main antagonist of Perfect Cherry Blossom. 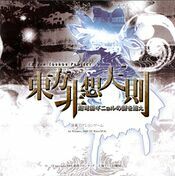 She's the ghost "princess" head of Hakugyokurou in the Netherworld. 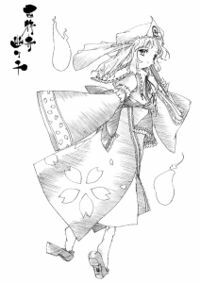 She first appeared as the Final Boss of Perfect Cherry Blossom, later becoming a playable character along with Youmu Konpaku (as a duo) in Imperishable Night and showing up as an expansion character in Immaterial and Missing Power, Scarlet Weather Rhapsody, and Touhou Hisoutensoku. 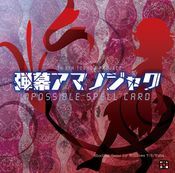 She would eventually also appear as the Stage 1 boss in Ten Desires, and as a Day 4 boss in Impossible Spell Card. 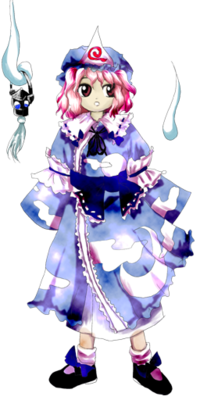 Unlike many departed spirits, Yuyuko resembles a living human; a humanoid. She is very cheerful and friendly: Her playful, good-humored personality, otherworldly beauty, and courtesan charm can have a disarming effect. She often makes bizarre and apparently nonsensical remarks and sometimes seems to overlook the obvious, leading to her characterization as an airhead or a ditz. As an instance, in Touhou Bougetsushou, she toyed with Youmu Konpaku as a daily occurrence even with Ran Yakumo present. However, at other times she will reveal an extremely cunning and perceptive side and will also sometimes display an extraordinary level of knowledge. 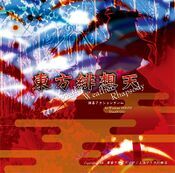 For instance, in Scarlet Weather Rhapsody, she was the quickest character to identify the culprit as Tenshi Hinanawi when the incident was in the omen stage (Yukari Yakumo spoke of the dwindling of phantoms as Komachi Onozuka's negligence, but Yuyuko guessed correctly). Additionally, in Ten Desires, she obliquely informed the playable character about the location of the incident regarding the divine spirits. She is also known for her incredible appetite. This is the ability to, without exception and without permitting any resistance, end the life of any living being, whether it be human or youkai. The only kind of creatures immune from this are Hourai Immortals. Clearly and simply, it is an unusually and dreadfully powerful ability. Although this ability is what drove her to commit suicide and become a ghost, it seems that she hasn't forgotten this ability since then, and it seems that she can use this ability in a carefree manner (though she doesn't act carelessly in the usage of this ability). However, whether she's able to end life only to the extent of fainting, or if she invites one to death gently, is unclear. During her lifetime, the latter was true. Her Last Word "Saigyouji Parinirvana" is said to be the very incarnation of this ability. This is the ability that enables her to manipulate ghosts and spirits, an ability she possessed even while she was alive. Although it's unclear what one is exactly able to accomplish with this ability, it seems to place Yuyuko on the role of the manager of the ghosts who stay for a while in the Netherworld. Because of this ability, she is able to let those from Hell stay eternally in the Netherworld. Her full name is Yuyuko Saigyouji (西行寺　幽々子). Her surname Saigyouji (西行寺, lit. "West journey temple") comes from her motif as a daughter of the famous Japanese poet Saigyō Hōshi (西行 法師), who lived in the late Heian period and the early Kamakura period. He passed away in the Hirokawa Temple (弘川寺, Hirokawadera), which could be where the character ji (寺) came from. Her first name Yuyuko (幽々子) actually doesn't have much meaning but can be literally translated to "ghostly child" or "ghost ghost child". The -ko is a common suffix in Japanese that's used in female names which literally means "child". The iteration mark "々", casually called a noma (ノマ), is used to indicate that the previous kanji should be repeated, thus her name's equivalent to "幽幽子". 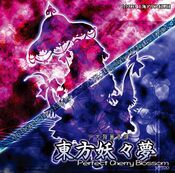 It's seen in the Japanese main title of Perfect Cherry Blossom (東方妖々夢). In Perfect Cherry Blossom she has maroon eyes, short wavy pink hair, and is surrounded by several small formless Phantoms. In all of the games, she wears a light blue and white kimono with dark blue trim and white designs; a blue mob cap on the front of which is a hitaikakushi with a red ghost insignia; and a veil of the same color of the kimono behind her head. She wears dark shoes with blue ribbons attached. In Scarlet Weather Rhapsody, her hair's slightly longer than normal, and her veil's more white than blue. In Ten Desires, her hair's a paler shade of pink, her kimono's still a light pale blue, and the ribbon around her waist, the ribbon going down her kimono, and the bands and lacing on her arms and collar are black instead of white and blue. She now wears a transparent layer underneath, her mob cap lacks the veil it had in Perfect Cherry Blossom, Immaterial and Missing Power, and Scarlet Weather Rhapsody; and her hitaikakushi's insignia has changed shape. Her black shoes also lack the blue ribbons. Throughout the games, the designs on her kimono change. In Perfect Cherry Blossom, it has floral designs; in Immaterial and Missing Power, the designs are of butterflies and flowers; in Imperishable Night, the butterflies and flowers design is replaced with a clouds and moon design; and in Ten Desires, the designs are of ghosts. The phantoms surrounding her sometimes carry an object. In Perfect Cherry Blossom, one of the phantoms carries a cherry blossom twig; in Imperishable Night, one carries a small blue lantern; and in Scarlet Weather Rhapsody onwards, they no longer carry anything. 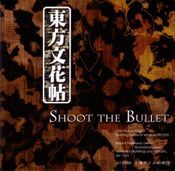 In ZUN's E-mails, ZUN described her as having a slightly tall height. Yuyuko is the final boss of Perfect Cherry Blossom. During its events, she made Youmu Konpaku find a way to make the Saigyou Ayakashi bloom to resurrect the corpse buried beneath it, apparently unaware that it was her own body. Forced to abandon her plan due to obstruction by Reimu and the gang, she resigned herself to continuing her existence as a ghost. Yuyuko made her appearance as the stage 1 boss of Ten Desires. Her in-game sprite was re-used from Perfect Cherry Blossom with minor adjustments. The heroines come to the Netherworld believing that Yuyuko's the cause of the mass or divine spirits. 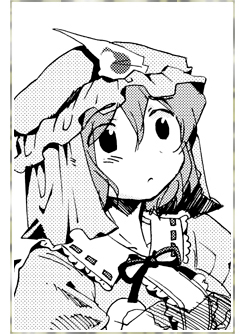 Yuyuko insists that they duel if the heroine wants to know about the incident. After she's defeated, Yuyuko doesn't appear injured and explains what the spirits are. She also redirects the heroine to the Myouren Temple, the location where all the divine spirits are heading. With Youmu Konpaku's scenario however, she wishes to investigate, but isn't allowed out of the Netherworld unless she defeats Yuyuko. In Shoot the Bullet, Yuyuko is a target level 8, where she'll use spell cards when Aya Shameimaru take photos of her and her danmaku. If connecting SWR with Touhou Hisoutensoku, then Yuyuko can become a selectable character to play with, although she appears in no scenarios. 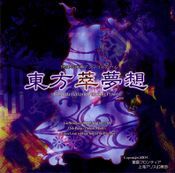 Yuyuko appears as a background cameo in Hopeless Masquerade on the Divine Spirit Mausoleum stage. She is seen with Youmu Konpaku as she endlessly feeds her rice balls. Yuyuko's different color palettes from Touhou Hisoutensoku. The 2nd one corresponds to her second color palette in Scarlet Weather Rhapsody, while the 3rd one corresponds to her Immaterial and Missing Power palette. Youmu is Yuyuko's gardener, bodyguard and fencing instructor. Youmu is unquestioningly loyal to her master, though she has a hard time understanding Yuyuko's riddles. Youki is Youmu's predecessor, who taught Youmu all that she knows. He also knew the full story of Yuyuko's connection to the Saigyou Ayakashi even after Yuyuko herself had forgotten. Yuyuko found him harder to rely on than Youmu. Yuyuko has been friends with Yukari since before her death, and is one of the few people who can see through her plans. 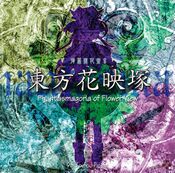 According to Perfect Memento in Strict Sense, Yuyuko was appointed her position by the yama, therefore it can be assumed that Eiki outranks her (Yuyuko also refers to Eiki as "Eiki-Sama" in Phantasmagoria of Flower View). Yuyuko knows Eiki personally, as Eiki dropped by to push her to teach Youmu more in Youmu's ending in Phantasmagoria of Flower View. 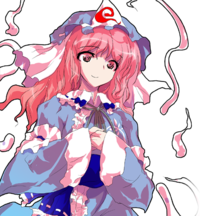 Excluding spin-off games, Yuyuko is the first, and currently only, character in the Touhou Project to first appear as a final boss, then later in another game as a Stage 1 boss. 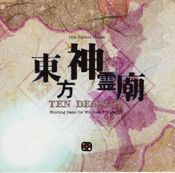 ZUN originally wanted to arrange her theme from Perfect Cherry Blossom and implement it into Ten Desires, but he ended up choosing against it because Yuyuko is only a Stage 1 boss in the newer game; hence why she ended up with a unique theme. She has the highest number of spell cards as a Stage 1 boss; even more so than the Stage 2, Stage 3 and Stage 4 bosses in Ten Desires. Her sixth palette in Touhou Hisoutensoku seems to resemble Hong Meiling, and there's another palette that resembles Ran Yakumo. Assuming that Yuyuko is the daughter of Saigyō Hōshi, she and Fujiwara no Mokou are actually distant relatives, since Saigyō is a descendant of Mokou's supposed father Fujiwara no Fuhito. Yuyuko's one of the few final bosses in the Touhou Project who, upon defeat, revives for a final spell card. Others are Eirin Yagokoro, Kaguya Houraisan, and Tenshi Hinanawi. Final boss, formerly the mistress of old Saigyouji clan, currently the ghost princess. Mainly she possesses the ability to manipulate death. Long ago, there was a divinely talented poet in Gensokyo. He loved nature and spent most of his time traveling. When he became aware that the hour of his death drew near, he chose to begin his eternal rest under the most beautiful cherry tree he could find..
That cherry tree has grown even more beautiful since then, charming many people into resting in peace beneath its blossoms. The tree with the mortuary charm developed the powers of a youkai after a while. A thousand years have passed. In the garden of the Saigyouji clan, there exists a youkai cherry blossom with a story behind it; it is called the Saigyou Ayakashi. For as long as Yuyuko had been there, this cherry tree has never bloomed, even in spring. "The girl who bears witness to death, at the time of the Saigyou Ayakashi's full bloom, shall be bound by mortality. So that her soul may rest in peace within Hakugyokurou, I will seal the cherry blossoms, and make it the barrier. My wish... is that she will never again reincarnate, and never again suffer pain..."
Yuyuko had read that breaking the seal on the Saigyou Ayakashi, making it bloom fully, would cause a certain someone to be resurrected; she started gathering spring's essence out of curiosity. Basically, those present in the Netherworld are mostly spirit beings. It is for that reason that she wondered about the corpse lying under the Saigyou Ayakashi with great interest, going as far as to consider breaking the seal. Her ability only enables her invite people to their death. Bringing life to something already dead would be a first. Thanks to an all-out effort put forth by Youmu, the gardener, every cherry blossom bloomed perfectly; every cherry blossom except for the Saigyou Ayakashi, which still bordered on blooming. By that point, Gensokyo's spring had almost been completely drained. No one would have imagined that a living human, bearing a tiny drop of spring, would visit. Perhaps it was because of her carefree afterlife, or maybe the record had aged beyond recognition, but Yuyuko ultimately failed to realize that the girl who was written about in the record... was herself. In the beginning, Yuyuko only possessed the ability to manipulate departed souls. Unconsciously, that power grew stronger, that eventually she possessed the ability to invite others to death. Terrified by her own ability, she committed suicide. After becoming a ghost, she thoroughly forgot everything about the time she was alive, and started to enjoy being able to invoke death. The reason Yuyuko can neither reincarnate nor vanish is because of the seal on the Saigyou Ayakashi. Once the boundary is breached, the time that was frozen will continue to flow, resulting in her death again. Reviving the corpse will destroy Yuyuko's ghost, so it's no wonder that the near-success of the revival ended in inevitable failure. After all, Yuyuko is not able to manipulate anything but death. The only person who knew the whole story, Youki Konpaku, grew slowly older due to the nature of half-humans, and disappeared with the belief that Youmu could inherit the truth about Yuyuko. For all time, Yuyuko will remain as the princess of Netherworld and mistress of long-dead Saigyouji clan. She shall never bear witness to the blooming of the Saigyou Ayakashi. A cheerful ghost maiden who won't go to Heaven and lives in the Netherworld. She can't remember when she died, because she's been dead for a long time. The reason why she can't rest in peace is that she must have left her regret in the human world. She's so carefree that she often acts tricky. Because of this, the straightforward Youmu is always troubled by this princess. But to tell the truth, she loves this nation outside of Gensokyo from the bottom of her heart. She's not good at physical attacks before and after death. Like other ghosts, she's always floating. She moves smoothly like a curve. You'll find yourself being defeated all of a sudden since her attack is too mysterious. She exists in the Netherworld as a ghost maiden. She can manipulate death, and she has been existing as a ghost since ancient times. It is said that experiencing death in Gensokyo is strangely cheerful in many cases. And she is also a cheerful ghost, too. Moreover, she is an airhead. Nobody knows whether she is usually like this or she just pretends to be. When she passed away, she may have forgotten one important thing. Her favorite weapon is the Phantom Butterflies. She uses it as an indiscriminate attack, because she doesn't consider the situation at hand at all. She teams up with Youmu Konpaku in this title. Normal speed only applies when she is used as a solo character. Her missile's wide shot is easy to use, it can attack in almost all angles, if an enemy doesn't appear from behind. However, it's inferior in destructive power. If you want something stronger, let's consider changing to Youmu. Recommended for players who don't consider at all. 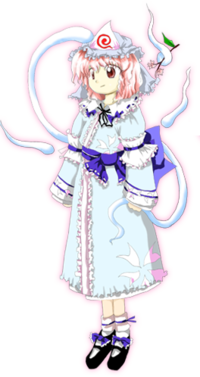 Yuyuko is a ghost princess who lives in the Netherworld. Like typical ghosts, she is quite the opposite of what humans call "down-to-earth", and her whims distract Youmu all the time. Unlike typical ghosts, her form has legs and feet. She is a ghost—the form of humans after death. There is no doubt that Yuyuko "lives" a whimsical life, but she doesn't unleash her ability lightly, so neither humans nor youkai have a reason to attack her. Still, many beings across the land fear her within their hearts. Personality: an airhead, but has an incredibly calm demeanor. is either always profound or thoughtful as it is difficult to have a conversation that does not have discretion with a spirit. 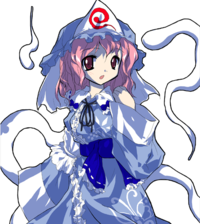 Yuyuko is a ghost princess who lives in the Netherworld, and is Youmu's mistress. She doesn't have too much of an interest in divine spirits, but the direction in which the divine spirits are headed intrigued her a little. This direction was Myouren Temple, a temple that was just recently constructed. It was a place for those who want to meditate to suppress their inner desires, but for divine spirits, which are the essence of desires, to congregate there... It surely didn't seem like the conduct of a typical temple. And it happened when she was thinking about that. Some humans were intruding her properties to investigate about divine spirits. After seeing them, she was relaxed that there was no need for her to do anything, and decided to continue with her flower viewing. How many times has she seen this cherry blossom flowering since she died? She got bored by the time she counted nine, and thought to stop there at one digit. But then she regretted that she should have at least tried to count up to somewhere around 9999, and now counts a random number every year, as if to make up for the past she hadn't counted. "Youmu, that will be the 5,873rd cherry blossom flowering by this year. Isn't it beautiful?" "Don't you think that's exaggerating too much, Lady Yuyuko?" The image file that contains all of the boss names (romanized) to display on the top-left during their battle in one of Perfect Cherry Blossom's demos has Yuyuko named Ayaka Saigyouji instead. The latest demo (ver0.11) has her named Yuyuka Saigyouji. This page was last edited on 30 December 2018, at 02:37.